Out of print. This pattern was available for $2.00. Diamond Vines is inspired by the treasures growing all around us. 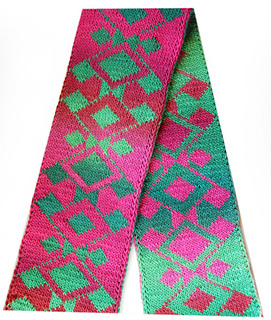 Diamond Vines is a motif worked over 31 stitches and 100 rows. It makes a beautiful and warm double knit scarf with approximately 800 yds of worsted weight yarn (400 each color), the sample was knit with Knit Picks Chroma Worsted & US size 7 needles. 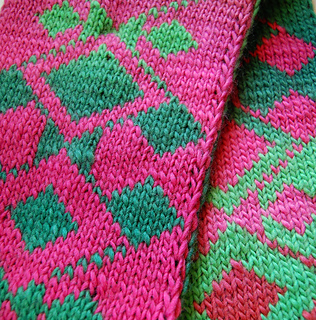 Diamond vines could be used as a colorwork panel insertion for sweaters, skirts, blankets, or anything else a knitterly imagination can conjure. Diamond Vines is a chart only. Double knitting instructions are not included.